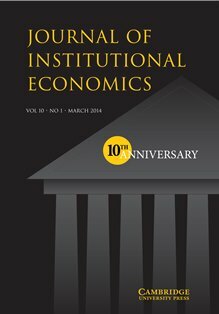 WINIR sponsors the Journal of Institutional Economics (JOIE), a multi-disciplinary forum for research on economic institutions. JOIE is an interdisciplinary journal devoted to the study of the nature, role and evolution of institutions in the economy that will be of particular interest to all academics working across the social sciences and the humanities. Although its primary focus is economics and business studies, contributions focusing on institutions from anthropology, ethnology, history, human geography, law, linguistics, management, philosophy, politics, psychology and sociology are welcome. JOIE has accepted or published essays by leading authors in the field of institutional research, including: Richard Adelstein, Douglas W. Allen, Bruno Amable, Cristiano Antonelli, Masahiko Aoki, Bas van Bavel, Kenneth Binmore, Peter J. Boettke, Daniel W. Bromley, Mark C. Casson, John B. Davis, Simon Deakin, Giovanni Dosi, Robin Dunbar, Thráinn Eggertsson, Teppo Felin, Alexander J. Field, Nicolai J. Foss, Avner Greif, Werner Güth, Geoffrey M. Hodgson, Richard N. Langlois, Peter T. Leeson, Brian J. Loasby, Deirdre McCloskey, Steven G. Medema, Claude Ménard, Thomas Miceli, Philip Mirowski, Joel Mokyr, Ugo Pagano, Elinor Ostrom, Francesco Parisi, Richard A. Posner, David Reisman, James A. Robinson, Vernon W. Ruttan, John R. Searle, Mark Setterfield, Mathias Siems, Viktor Vanberg, Mary Shirley, Sidney G. Winter, Oliver E. Williamson and Ulrich Witt. JOIE is published by Cambridge University Press for Millennium Economics Ltd. Since its first issue, published in June 2005, JOIE has gained in visibility and prominence. In 2012 the journal was listed in the Thomson-Reuters Social Sciences Citation Index®, achieving a high impact factor for a newly-established journal. The current Clarivate Analytics impact factor is 2.139. WINIR membership includes JOIE. Join WINIR to gain access to the entire full-text archive of JOIE. Information about some of the planned special issues can be found here.